Master has been in a shopping mood for several weeks now! First she got us a new water fountain to replace our old one, which was no longer running smoothly. All three of us were really excited to finally get a new fountain and we waited eagerly for Master to assemble our new toy. We love the new water fountain, especially Benji, who likes to wash his face there. 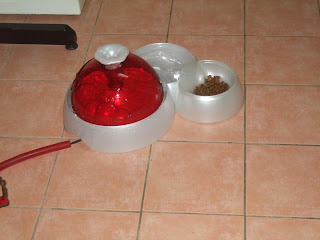 Our previous one was blue in color, so this time around Master got us a red one; it is her favorite color after all. We don't mind the change in color. So long as we get to drink fresh water every day, we love this new water fountain just as much! 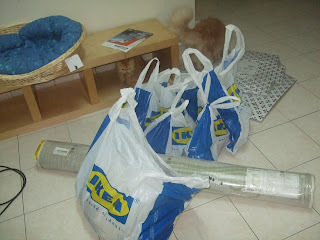 A few days after the water fountain purchase, Master and B went on another shopping trip to IKEA to furnish our home with new stuff in time for the Raya celebration. They came home with so many bags and I was really curious to see if they got me anything. Can you spot me among all the bags they brought home that day? I was right and Master did get us something - a new comfy cat bed! I love this cat bed and since my brothers didn't seem too interested to sleep in it, I've turned it into solely mine! It's now nicely placed in Master's room and I get to sleep in it every night! Recommended by the Clark Howard Show in USA, Zenni Optical offers eyeglasses made from the latest modern materials, manufacturing and marketing systems to bring you the highest quality product. With excellent durability, safety and comfort, you will find an assortment of beautiful eyeglasses at extremely affordable prices. Starting at $8 a pair, you should definitely check out Zenni Optical today for the best eyeglasses offers online! whoaho!! yee haaa.. 1 am first.. tak kisah la walaupun bukan post ada bintang kan..
Love just reading the post.. fun la..
Wow, while I've been away you've been posting like crazy! I just got home and wanted to say a quick hello, start working my way back onto your top Mariucans one comment at a time...I'll be back to catch up soon. Wow! Shopping sakan! Nice bed, Pheebs! I love the bed, the fountain and all! Of course I love the pink lappie too! Not forgetting the pink glasses! Hey looks like the one I have but mine was gold! Pink looks nice on fair skin people like you! Love rimless glasses! Darn, that cat sure is one lucky little critter ... LOL! Hey Pheebs.. Anja here.. your eyes are so shut.. what are you dreaming off lah.. and lidah you pun tersempal..lol.. cute lah you.. just like me...lolzz!! GP!! How does the fountain work?? Does it spurt out water or what and I see it has a space for food as well?? Pheebs.. Aggie Waggy here... so cute lah you sitting at the edge like that.. eh becareful should the basket toppled over.. it happenened to Nina yesterday....lolz!!!... merk!! What are you up to?? Miss me?? Lolz!! Wow looks like you had a ball. I am working on my post now. Ge I wish there were some way to move Jean's AGP list up to my siide bar also. If you know how I can change the code and make it fit without loosing the info and updates please let me know. ps: I received the money already from blognet- sweet! oooohhhh.. what a great Master you have!! 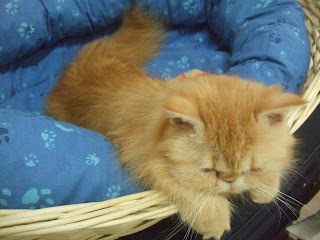 Giving you such a comfy looking bed.. it makes me feel like sleeping! LOL! Cewah... Rizal ngetest lagi. Congrats dapat 1st commenter. Here I takde chance langsung la Marzie! Wow that water fountain and kitty bed are really going to be popular with the the little ones. Thanks for the fun post and great photos. And.....before I forget again.....belated Hari Raya wishes. So busy this month I forgot many of my blogging friends had Eid. Your Master got some great taste and style. She must adore you so much adorable cat for buying you a very comfy bed..
Tell your Master, the pink eyeglasses looks nice..it matches her new pink lappy *wink. MEOW Aunty LJ! I love Master and B for getting us the new cat bed, some more the cushion so comfy! Anja and Aggy can come and share my bed anytime they want meow meow! Wow.. your cats are lovely! How do you cater with all these cats need? Do you let them go out from house? Hola Haaziq!! Oh u have a cat too eh? Is it a Persian too? Hey sweet GP!! How are you today.. me feel strange not 24/7 in front of Miss Fly..lolzz!! Have a great day (wink).. it's just starting for you right?? lolz!! I am poised and ready to vote for Mariuca, but no one has the guts to take on the Genie Princess today! Finally!! Vote, vote, vote for Mariuca! I saw Roxy's comment and so here I am.. vote vote vote for Mariuca...hehe.. Good luck dearie! There is nothing to do today..
haha cutelah nick wants to a cat in the next life! marzie sure or not! ada banyak sales sekarang!!! i must go shopping too! Nighty nite everyone. I am headed to get some more rest. Hola Phoebe, looking super cute, as always! :) Panas giler la today kan? Marzie ..happy Wednesday. Hope bonoriau contribute bit for you. 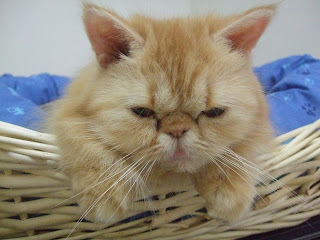 Oh I love Persian cats my Sugarpuss was a Persian. But she always shed a lot of hair. your cats look so cute and cuddly. What a wonderful owner they have! Alamak, kena buat chicken dance ka..
siapa ni bukan dah buat chicken dance kat emila's..
okay laahhh.. bukan chcken dance..
LJ, tak pa slow n steady musti boleh win the race punya..
memang kena test test dulu..
mana tahu jerit.. "yahooo" tetibe dalam masa serentak ada jugak orang post jugak kan? Pak bOno, thank you thank you bukan merayu tapi hanya terharu.. ehhh ahh eahhh ahhhh -----> please sing dangdut style ya..
Memang kids tu semua suka, sebab master dia sekarang kan dah kawan ngan restnrileks - rattan = weaving..
marzie, kena buat lagi chicken dance kerrr....? Marzie, wah pak bOno buat spesial dedication to you too..
Alamak debbie dah masuk kerr..
pergi laaa rehat-rehat dulu.. kan cuaca panas ni.. rehat yerr.. kang dehydrated pulak..
on the way nak balik dari speedy video, tadi ternampak macam benda kat tepi jalan.. Bila dah dekat, baru perasan rupanya kucing..
Basah kuyup habis.. i think kena langgar tapi masih hidup lagi.. mulut dia ada darah.. Sebab kena langgar, tak boleh bangun, i think that's why kucing tu basah kuyup. My agak mungkin kena langgar masa hujan, lepas tu tak larat nak bangun balik, so hujan lebat tadi habis basah.. since kucing kita tahu kan tak suka kena air. 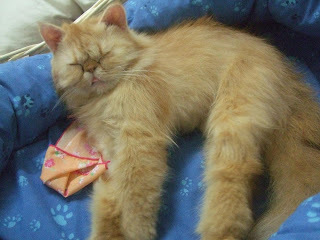 That cat looked fragile, siap badan terketar-ketar.. I am trying to shed off the image from my mind sebab terus terang.. sebak la tgk (ni pun terngiang-ngiang gambaran). I am sure it must be somebody's cat sebab tgk badan kucing tu sihat and plump. Rasa macam nak angkat ja tadi. Happy Wednesday Monica! It's been raining the whole day here. Hi LJ! Maybe it's good also that you're not online 24/7, but are u keeping up with Boldie? Or not, I nak biatch dgn sape pasal the Logan biatches? He he! hehe.. nasib baik tgh kosong, kalau you stay lama sket tadi.. musti dah dapat spot 1st.. whoaho!.. 1st spot sana.. 1st spot sini..
ni macam boleh nyanyi lagu siapa tuu -- ku ke depan.. ku belakang.. ku ke kiri.. ku ke kanan.. tapi berjaya kekal 1. hehe.. Thanks Marzie for the hugs..
tu laa ni yang cuba ceria-ceriakan diri nak get rid off gambaran tuu..
ehh jom nyanyi kat emila's..
alamak, speaking of blakie, mana laah dia merayap.. It's sad when my first comment is about the comments. Rizal, Emila & Lady Java...I'm not worthy!!! (she says bowing to your comment powers). Let's see if I do this right. Lovely Kitty, your master and B rock the house with all the love they have for you and your brothers. Please be sure to remind Master how much you appreciate it by giving them kisses very early in the morning while they pretend to be sleeping. Now, as for the pink glasses... As someone who wears glasses (and wishes she could huck them into the river) wouldn't it be easier to buy yourself a pair of pink earings or a pink hair piece? You could still match the rockin' laptop, but not have to have the glasses. Is that what I'm supposed to do? Leave multiple comments on each topic? Thanks - restnrileks is blushed. MEOW Grandy! We love Master and B for constantly pampering us with a whole lotta goodies and toys! how come when i type "bonoriau.com", it brings me to GP site..? or something internet related momentarily thingy kind of thing ? tadi dua kali jadi macam tu.. satu taip.. satu dari cuba klik kat restnrileks link..
Oh you're right, I did forget Phatelara in my list of comment worshiping. Hi Rizal! Glad you like the comments. Hi Genie Princess...you're lighting up the sidebar of Roxiticus Best Blogs today, lookin' good! Huffing and puffing to try to get back into the top Mariucans...busy crazy day here in the Roxiticus Valley, so much work to do! Just caught up on my DVR of last Sunday's Desperate Housewives last night...I'm really liking the show this season, Gabby's chubby daughter is just too much! Have you been watching those Other Desperate Housewives? your kitties have such beautiful faces i love em. i want them ha! alamak, lj nak make a comeback? lariiiiiiiiiiiiiiiiiiiiiiii! lj ibarat kura-kura dalam dongeng kura-kura dan arnab. Slow and sterady dia akan menang! I've been the rabbit once; hehe tertidur last minute! haha, yakeh, naugthy lar pheebs! hehe. Ariel is always getting bullied by Brownie even tho' brownie is younger. But it is because Ariel doesn't mind getting bullied. 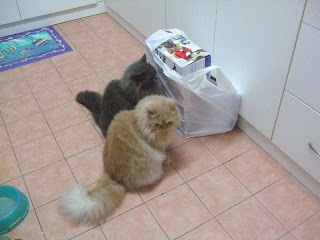 She will only scold brownie if she disturb Ariel during meal time. haha. haha, i dunno lar if i looks good. sometimes i think i looks good wt it, sometimes i think i look ugly with it. Tak tahu lar! hehe. aiks, debbs also in the race kah? Then i must cheer for her too! eh, but debbs, i forgot lar, are you a coffee drinker? speaking of blakie, petang ni kena carik mana dia pergi..satu hari suntuk tak balik rumah tuu..
Jean, thanks for cheering for me hehe but I'm now number 4! Hehe..kasi can la to Librans yg 2 org tu. FYI, I drink coffee but not addicted. I prefer hot cocoa, esp hazelnut flavoured ones, yummy!! Rizal, Blakie dah balik ke? Ladies and gents, I've started twittering, where's everyone anyway? teropong2 takde pun sapa2?? Thanks for following me on Tweet Tweet, Marzie! I followed you too, but you don't tweet! Hehe..
EC website down again, huh? blakie dah balik.. bising ya amat semalam.. satu rumah boleh dgr... bila masuk pintu... bukan mengiau tapi dah menjerit..
bila sebuat "blakie" baru manja-manja eeeioouwwww..
Kak emi, blakie pergi ikea nak bakul rotan tuu jugak..
macam yang phoebe pakai katanya..
dia balik merajuk terus keluar bersosial ngan geng2 belakang rumah..
hehe rizal, cepat pergi ikea belikan bakul, jgn lupa kusyennya sekali! hmmm i think it's a great idea kalau rizal buat bakul untuk kuching dan jual pada kami!!! lol, blakie blakie...lapar lah tu! Mine is comfy too! Woof! But, it's a great fashion accessory indeed. Just came back from Zenni Optical, was browsing some frames for Mama. Huge selection and nice prices, thanks for the hint Marzie!!! Woof! I agree with Sushi, glasses make great accessory! haha, rizal, amazing race, ya! i love!! come on', let's see who check in first! lol! marzie, duwan lar! malu lar, wan to take my picture like that, with and w/o glasses! but i will surely consider it. Maybe i don't look as ugly as i thought le, hor? hehe. Mariuca~ You do know you will have to come back and tell us if you got the glasses...right? Wait...unless someone types in under me. I will be the 200th comment on this one! !